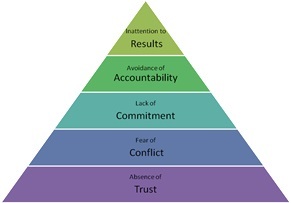 I am a fan of Patrick Lencioni and one of the three pillars in our business culture is The Five Dysfunctions of a Team. His pyramid of success is a benchmark in establishing great business practices, that of course work in any relationship you desire to grow effectively. When I was young, I was taught two principles that have stayed with me regarding learning new things. First, you really “gotta-wanna” be taught. To the unteachable, this must be a horrible world to live in. The attitude that you can always learn something new and of value is a key to happiness and well-being. I’m not a psychologist; I just know this is true. I was once taught that you can’t teach a bad lesson to a good student. I often think of this, especially if the presentation isn’t stellar but I know the material is. What can I learn from this experience? Secondly, I was taught the principle of a “Mug-Wump”. This is the person who decides to NOT embrace new teachings, to NOT be a part of the group, to NOT be teachable. They also choose to NOT move from their position, to NOT take up a cause that would move them from what they perceive to be their comfortable spot. “Don’t upset my apple-cart; don’t try to change my world” is their thought. These folks are fence-sitters and are properly called Mug-Wumps because their mug is on one side of the fence and their wump is on the other side. Fence sitters. What a very uncomfortable position to be in—and yet, this is where many find themselves. The solution is to embrace the opportunities of change. Will change move one from their comfort zones? Yes. Will learning new things disavow prior knowledge and teachings? Probably not; look at learning new things as ADDING to the base of knowledge and experience you already have. Who doesn’t want to add more to their lives? Finally, there are those to find new concepts and teachings threatening. Why is this? Because they don’t see the truth that there is good all around us, and that no one person or thing “Owns” all of the good things out there. We can collectively and individually become more than we are. I invite everyone to embrace new concepts and ideas. We are all far from perfect; so an opportunity to advance in positive ways is just that…..an opportunity. Let’s choose to NOT be mug-wumps, and to be in the Gotta-Wanna camp of learning. Milestones are the marks we have made in our journey to verify we have indeed traveled in some direction. They may include achievements, new beginnings, personal firsts or bests. Markers are often over or under-rated. They are what they are; however, I would encourage us to make note of milestones that on the surface are not so life changing, but ARE an omen of things to come and perhaps do define who we are or are to become. Milestones are often prepared for; in other words, they don’t always just happen in the normal course of events. Examples are many, such as scaling Mount Everest, running a marathon, losing ten pounds, writing a book, etc… Preparing for retirement is a big milestone for the baby boomer generation. I hearken back to the inspired process of THINK * PLAN * DO. In the case of my grandson, I thought about giving him a Cheezit. Is he old enough? Will his mother approve? I put my action plan into motion, and NOW a milestone has been reached. My grandson has reached a state of nirvana, and I have destroyed the trust of my daughter. Remember that all milestones are not events that shape our lives forever; but small or large, they should be planned for and remembered (even recorded)… come what may. 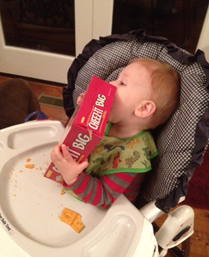 Certainly my introduction of Cheezit’s to one of my grandsons was a life changing moment. As you can see in the picture, he was quick to embrace this introduction with gusto. As mentioned, his mother was not so excited, but for me, it was a proud moment.